Ideally located close to both Maidstone and the Medway Towns our Camping Cabin, Shepherds Hut, Festival Tent and themed Bell Tents are perfect for short breaks, romantic getaways, or longer self-catering holidays in the Kent countryside. Our self catering accommodation is located close to Kits Coty House (English Natural Heritage Site) in an area of outstanding natural beauty on the edge of the picturesque North Downs. We received recently a Bronze Award in the category "Glamping Business of the Year" at the 2017 Beautiful South Awards. Last year we won a VisitEngland Rose Award for Service Excellence and also won Silver in the Glamping Business of the Year category. In 2015 we won bed and breakfast of the year in the Medway Culture, Design and Tourism Awards and also a Bronze in the Beautiful South Awards for Excellence in the category of Self Catering Holiday Provider of the Year. In addition we have now accumulated over 400 five star reviews across Tripadvisor, Facebook and our online booking system. The ideal location for glamping in Kent, we are located between Maidstone and Chatham within 40 minutes of both London and the Kent Coast. Numerous tourist attractions (e.g. Leeds Castle, Chatham Dockyard etc.) are within easy reach providing plenty of fun activities to fill your days. Alternatively just chilling out enjoying your luxury accommodation and surroundings can be order of the day. 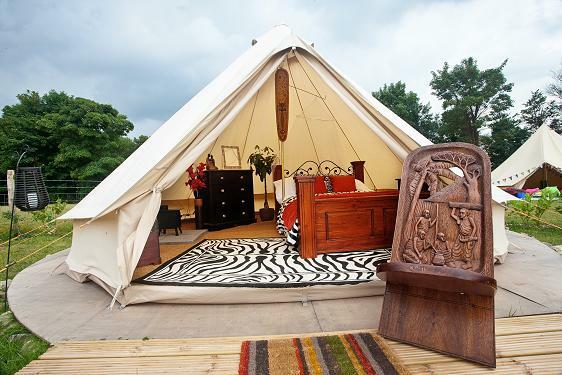 Glamping (or glamourous camping) has become very popular in recent years with participants escaping towns and cities to enjoy the countryside in high end camping type accommodation but with all their home comforts included. 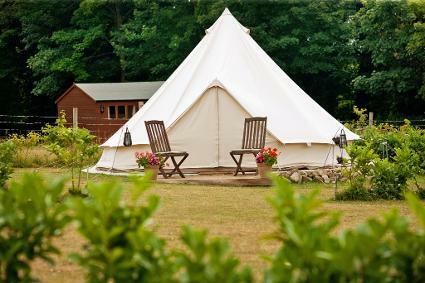 Here at Kits Coty Glamping we aim to offer exactly that. Whether you stay in our quirky themed Shepherd's Hut or decide to get closer to nature in our tented facilities, you will be assured of a warm welcome, a warm bed and experience a truly unforgettable and extremely cosy night under the stars. Ami and Mark look forward to meeting you soon! !